Every single one of us faces the challenge of safely navigating the “Path to Paradise”, especially in the landscape of today’s ever-evolving world. In this regard, diverse articles addressing an array of topics have been written and posted onto the Uswatul Muslimah website. From media and technology, to self-improvement, motivation, marriage, children and more, various spheres of a Muslimah’s life were considered and discussed. These articles aim to identify the challenges and hurdles facing a Muslimah of the twenty-first century, together with providing the solution to these predicaments in the light of our beautiful and perfect Deen. 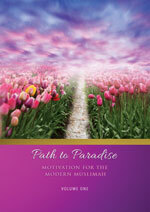 This 394 page compilation entitled “Path to Paradise – Motivation for the Modern Muslimah” comprises of many of these articles that were handpicked for the benefit of one and all.